Lend warmth, depth and character to your sterling silver jewelry, decorative silver objects, crafts and household items by antiquing them through the oxidization process. Choose from natural or chemical methods; hard-boiled egg yolks, kitty litter or liver of sulfur to give silver pieces that rustic, just-unearthed look and the patina of timeworn treasures. Bright, shiny sterling silver is lustrous, but antiquing enhances the intricate beauty of details such as etched and stamped designs to make your jewelry, handicrafts and even grandma's teapot distinctive. 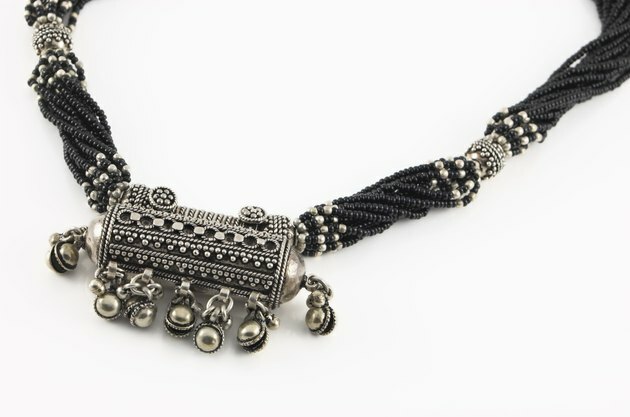 Oxidizing silver jewelry and other silver items highlights the intricacy of the design. Depending on the oxidization method, you can produce a range of iridescence and hues in your patina, from fiery pink, teal and peacock blue to dark-gray and black. You may strategically remove the patina, or tarnish, from specific areas with a micro-abrasive foam pad for a dramatic effect. This flexible, silicone pad removes the patina on the raised surfaces, leaves any recesses you wish dark, yet is flexible enough to get into crevices you want to remain light and shiny. Rub in a circular and back-and-forth motion to prevent scratching a pattern into the silver. Commercial silver polishes also effectively remove tarnish when applied to only those portions of the patina you wish to remove. For a soft, brushed look, use fine steel wool to remove the patina. Tumbling the piece in a rotary tumbler with steel shot produces a lustrous shine on silver jewelry, but it does not remove all the patina. Ensure your piece has reached your desired level of patina before tumbling. Follow the tumbler directions for use. You can also buff your silver jewelry and larger pieces to a high shine with a polishing cloth. Patina fades and wears off over time; seal it with Renaissance wax or acrylic spray lacquer to prolong the aged look. A high sulfur content makes eggs an effective natural option for oxidizing sterling silver. For one piece of chain jewelry, such as a bracelet or necklace, use the yolks of one to three fresh eggs. For a teapot or items with larger surfaces, use about six egg yolks. Boil the eggs for 10 to 15 minutes; shell them quickly; set aside the whites; and place the hot yolks into a zip-lock bag and seal. To save time, simply use the whole egg, including the shells. Knead the bag to mash up the eggs; then add your silver to the bag. It's okay if the silver comes in contact with the egg. Within 10 minutes, the hot eggs release hydrogen sulfide, and the silver begins to darken. The patina gradually develops and deepens so keep an eye on it and remove the silver when the desired patina is reached; leave up to 10 hours for the maximum darkening effect. You can re-heat the eggs to speed up the process if it's darkening too slowly. When it's ready, remove your piece, wash and dry thoroughly, and discard the eggs. Antiquing silver with kitty litter may not sound appealing, but recycling your cat's used clay-based or natural pine litter produces interesting results. The ammonia in your cat's urine is the active ingredient in this method. Discard solid waste; then scoop enough litter to fully bury your piece into a large zip-lock bag; add your silver and seal. Check periodically to monitor the process as different effects are achieved, depending on how long you leave the silver in the litter. Leave it for a few minutes up to several hours, and remove the silver when it reaches the desired patina. Wash and dry the piece thoroughly; remove any tarnish you wish; then polish and seal. Experiment with other natural patinas, such as sour milk or old wine, to achieve various hues and effects, monitoring its progress as you did the kitty litter method. With its pungent odor of rotten eggs, liver of sulfur (LOS) may stink, but it does a wonderful job of antiquing silver. The standard choice of many jewelry artisans, liver of sulfur is a mixture of potassium sulfides. Available in solid, gel and a convenient liquid formulation, liver of sulfur works quickly, and it's safe when used as directed in a well-ventilated area or outdoors, wearing safety glasses and plastic gloves. To antique silver items that are too big to submerse in a liquid formula, use a Q-tip to strategically apply the LOS solution. To antique with liquid LOS, you'll need a ratio of 1 bottle capful of the LOS to 4 cups of hot water -- just under boiling -- mixed in a dedicated container. Use an eye dropper to fill the cap. Add the LOS slowly to the water; then mix with a plastic spoon; the water will turn a medium-light yellow color. Recap the bottle. With a pair of tweezers or tongs, dip your silver piece into the hot bath and hold it there. As the metal heats, it first becomes a yellow-gold, then a pink-red or a copper hue, and finally turquoise-purple before turning gray, then black. After 2 to 2 1/2 minutes, the silver will be very dark. At any stage, when the silver reaches the desired effect, immediately remove it from the LOS-and-water solution and submerge it in a clear water bath; then thoroughly rinse it under a faucet. Dry thoroughly with a paper towel and create the level of patina you wish with the micro-abrasive pad, steel wool or other method. Before oxidizing, ensure your jewelry is clean, degreased and dry; otherwise, fingerprints and pockets of grime will appear in the patina. Candidates for antiquing include sterling silver blanks in a variety of shapes and sizes, stamped with letters and designs, to make articulated earrings, bracelets and necklaces. The natural egg yolk oxidizing method should be used for jewelry with porous gemstones, such as turquoise, lapis lazuli and other soft stones and organics such as shell and pearls. Jewelry featuring cubic zirconia, glass and man-made gemstones may be antiqued with liver of sulfur. With a mosaic of deeply etched designs that are perfect for the antiquing process, vintage cutlery can be handcrafted into jewelry, wind chimes, napkin rings, candleholders, lamps, wall hooks, spoon lights, abstract sculptures and more. Old silver coins can be transformed into beautiful jewelry and are used in home decorating projects, such as countertops and decor items like vases and sculpture. All the small details in the coins are revealed through the antiquing process. Take note that purposely tarnishing coins devalues them. Turn household items, such as old keys, vases, teapots and more into eye-catching decor accents by antiquing them. To enhance patina on silver jewelry and items with smooth surfaces, consider texturing the metal first by hammering. Another option for creating patina quickly and easily without oxidizing is to apply a black permanent marker all over the areas you want to patina, let it dry completely; then remove patina where desired.